We knew the likelihood was high he would be in London, but in a season that has been difficult one never wants to assume. Therefore, it was with relief and great joy that Federer's fans watched him secure his spot with a straight set win against Kevin Anderson. And as Roger said himself, he wanted to qualify with a win, not because of someone else losing. This was the first meeting between the South African Anderson and Federer, and you could tell from the start Anderson was feeling the nerves. There really was very little drama in the first set as Fed got the early break and held serve with relative ease to close out the set. The second set seemed to be going along even easier with a two break lead. However, there often seems to be a little bit of nerves from the GOAT these days, and knowing what was on the line, he failed to serve it out at 5-2, and then was down two break points when he tried it again at 5-4. However, his serve came through for him multiple times in this match, and it surely helped him here to close out the match in straight sets 6-4 6-4. Some Federer critics may talk about how this year, a "down year" by his high standards, he didn't manage to stake his spot at the acclaimed World Tour Finals until a few days before. But it really doesn't matter because the fact is that he is there for the 12th (yes, I said 12TH!) year in a row. Not only that, he has won the whole friggin thing over half the times he has been there - six to be exact - and that is against the top 8 players in the world (oh, and can I just mention Nadal has never won it?). Sure he is ranked #6 and has only won one small title this year. 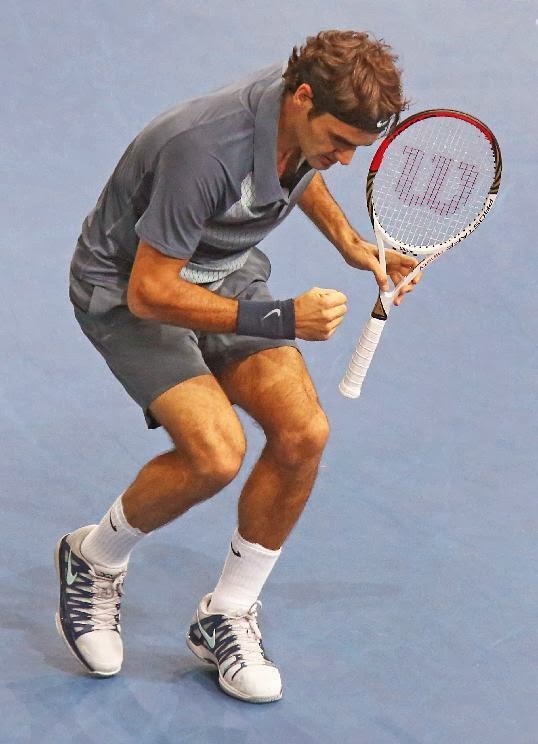 But that means nothing because Roger knows how to win this thing. He plays incredibly well indoors and he could come around after a season of struggles and show that he is still a major factor in men's tennis. There is still a week-and-a-half left in the 2013 season. Though I will happy to move on to 2014, wouldn't it be amazing if the great Federer could close out this season with an incredible comeback? But for now I am just celebrating the fact that he is once again one of the elite 8 who has a chance to show what he is made of next week in London.